When Tommy Chong was on "That 70s Show," his character worked in a Fotomat. It seemed like such a convenient business back in the time when we had rolls of film bouncing around in the car, and were looking for a place to drop them off and get them developed. Today, of course, most of us have digital cameras or just use our phones to take pictures, no developing needed. What anguish the Fotomat folks must have suffered as this development took hold. But their tiny little huts will always be fondly remembered. Also, Wikipedia claims they were pioneers in video rental! What? 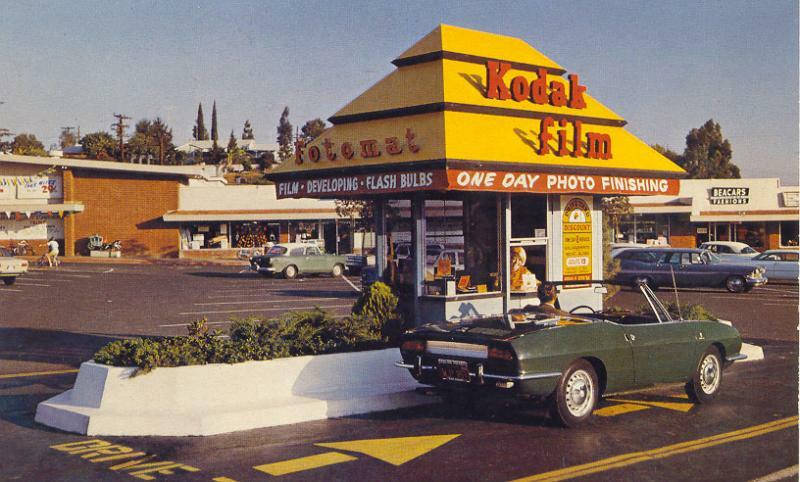 Did anyone ever rent a movie at a Fotomat? Yet another business that soon would be ground into the dust by technological advances. Netflix, anyone? Where did those people go to the bathroom? There's one in our neighborhood that has been converted to drive-through coffee. I've seen that application a couple of times. Don't forget one famed appearance of a Fotomat -- as the site of the launch of the time-traveling DeLorean in "Back to the Future." We have one that was converted into a drive-thru coffee place. And there are actually still some standing that have been vacant ever since Fotomat went out of business.